As the conflict in Syria continues, with the United Nations reporting a dramatic increase in the numbers of refugees fleeing the country, Syria’s economy, too, is a victim of the violence. And its chances of recovery are looking slim. Syria’s violence, the displacement it has caused and the resulting collapse of labor markets have all splintered the Syrian economy so that it is “no longer one economy but a mosaic of economies,” he continued. Major damage to urban infrastructure, unevenly distributed between rebel and loyalist areas, is causing further fragmentation. “In some cities, such as Hama and Homs, there are parts of the city that have escaped a lot of the violence and have the main infrastructure intact, while others parts of the city have been flattened,” Abboud said. Loyalist neighborhoods tend to experience limited damage, he explained, while neighborhoods the government considers to be rebel areas are severely damaged or entirely destroyed. Abboud said the division between regime- and rebel-controlled areas also prevents “the flow of resources, goods and peoples,” which only worsens the economic crisis. “So even when products are making their way into the country and they can be paid for, they are not necessarily reaching the hardest-hit areas because of the insecurity of transport,” he said. Meanwhile, Abboud said the outflow of refugees from areas of agricultural and industrial production continues to worsen, and that the ranks of the professional class are thinning, perhaps permanently, as well. He said that many who flee Syria are resigning themselves to the idea of living outside the country even after the end of the conflict, as there will not be many opportunities for them in Syria should they return. 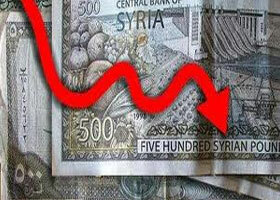 Abboud identified sanctions as yet another factor driving the Syrian economy toward collapse. External embargoes have distorted Syrian oil production, which once represented 25-30 percent of its gross domestic product, but which is now completely reoriented toward domestic demand. Sanctions have also reduced the government’s ability to access foreign currency, stopped billions of dollars in foreign investments and had a profound impact on Syria’s trading capacity. The government in Damascus is not completely isolated, however. “The Syrian regime has benefitted from the strategic support of a few key allies, especially Russia and Iran, and to a lesser extent China, Iraq and Lebanon,” Abboud said, adding that some countries, such as Lebanon and Iraq, have apparently violated sanctions. But fear of retribution from the United States prevents other outside actors from doing business with Syria, he said. As for the prospects for economic recovery after the conflict, Abboud said that “rebuilding the economy will be very different from reforming it.” Economic revival will have to take into account the nature of the war economy, he continued, including its geographic divisions and its effects on capital flight, for example. This will mean that the future leaders of post-conflict Syria will have to look for outside aid, which will likely mean debt as well as adjustments to sectors of the economy that do not meet reconstruction demands. “Syria’s economy does not have enough oil, a strong productive base or large domestic savings to avoid such a situation in the future,” Abboud said.